Part of the “If You Were Me” series by Carole P. Roman but this one is a little different. Most of the books in the series are places were people actually live and this one is ahead of its time. 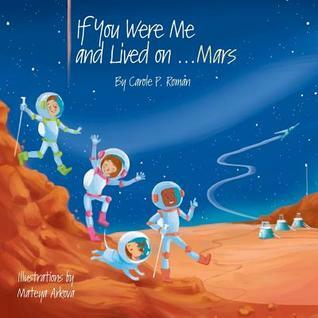 If You Were Me And Lived On Mars gives the info we know about Mars and imagines if humans were to live there. I learned so much about Mars from this book. Some stuff is a little scary to think of, especially if we actually live there someday. The air and the land are not really set up for humans yet but scientist have plans on what we could do to live there. There is something unnerving about the facts. It is part of the reason I have had a hard time writing the review. That is the only negative to the book for me, the fear of the unknown I guess. People have not made it to Mars...I don’t think? I don’t think they will in my lifetime but boy what a day it will be when or if it does. I definitely applaud the originality of this book. I did not expect it in this series. I intend to read the rest of the series as Ms. Roman has been teaching me so much. If only I had had these books when I was a child. Sign into Goodreads to see if any of your friends have read If You Were Me and Lived On...Mars.